A huge Coro retro gilt sterling coat pin from the 1940s. This 4-1/2" x 2-5/8" brooch features branches and flowers with aqua blue claw-set foil-backed rhinestone centers in a swirling holder. It has a safety catch, it is signed CORO STERLING with a small etched S16, and it is in excellent vintage condition with no chips, cracks, dents, bends, corrosion, losses, damage or repairs, but please note that the blue rhinestones are a little foggy - the settings are open-backed. All items are thoroughly and conservatively graded and all condition issues are noted; all items are vintage or antique and may have slight signs of gentle use. Expedited tracked and insured parcel shipping to the U.S. starts at $19 (other spots may vary, air is higher). Items paid with a credit card will be shipped to confirmed addresses only. We do ship internationally. All of our prices are in $US. PLEASE NOTE: We DO NOT accept PayPal. An early and fine signed Coro Art Deco sterling silver necklace with marquisites c1920-30. This stylish 17-3/4" necklace has a springring catch and a 1-1/8 x 5/8" center drop with a large marcasite stone; it is signed STERLING CORO on the drop and STERLING on the loop. This item is in excellent vintage condition with no chips, cracks, dents, bends, corrosion, losses, damage or repairs. All items are thoroughly and conservatively graded and all condition issues are noted; all items are secondhand and may have slight signs of gentle use. Expedited tracked chipping starts at $21 (other spots may vary, air is higher) - tracking and insurance are included in shipping quotes. Items paid with a credit card will be shipped to confirmed addresses only. We do ship internationally. All of our prices are in $US. PLEASE NOTE: we DO NOT accept PayPal, only VISA and MASTERCARD. A great looking vintage Murano glass sautoir necklace c1920s. This chrome plated beauty features a 15-1/2" chrome plated chain with links and yellow Murano glass spacer beads as well as two 1/2" glass barrel beads with pink and green rose floral cane inclusions and chrome end caps. 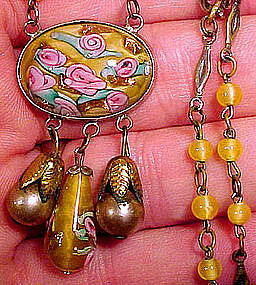 There is a 1-3/4" x 1" pendant at the center consisting of a large disc of yellow Murano glass with included flowers and three drops, one of floral glass and two (additions) of glass pearls. This beauty closes with a spring-ring catch, and it is in very good original condition with no chips, cracks, dents, bends, damage or repairs other than the /addition/replacement with the pearls and some minor wear to the chrome plating and some minor greening on the "leaves" above the pearls. All items are thoroughly and conservatively graded and all condition issues are noted; all items are secondhand and may have slight signs of gentle use. Surface shipping to the U.S. starts at $6.20 (other spots may vary) - insured is higher, and mandatory on items over $95 if paid with a credit card. Items paid with a credit card will be shipped to confirmed addresses only. We do ship internationally. All of our prices are in $US. PLEASE NOTE: We DO NOT accept Paypal. 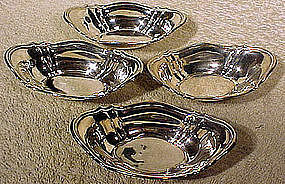 A set of four Birks sterling silver nut or mint dishes 1940s-50s. These 4 x 2-3/8" dishes weigh 81.4 grams, and they are in excellent original condition with no corrosion, losses, damage or repairs other than a tiny dent in the upper lip of one dish, some very slight bends to the upper edge at one end on two dishes and some very shallow penpoint dents in the bottom of one dish (all are very minor and barely noticeable). All items are thoroughly and conservatively graded and all condition issues are noted; all items are secondhand and may have slight signs of gentle use. Expedited tracked post to the U.S. starts at $20 (other spots may vary, xpresspost is higher) - insurance and tracking included in shipping quotes. Items paid with a credit card will be shipped to confirmed addresses only. We do ship internationally. All of our prices are in $US. PLEASE NOTE: We DO NOT accept Paypal. A 10k yellow gold solid church charm. This 3/4" x 3/8" charm in the form of a church with steeple is from the 1950s-60s. This charm weighs 2.1 grams, it is stamped 10k, sand it is in excellent original condition with no dents, bends, corrosion, losses, damage or repairs. The key-ring bale loop is also 10k. All items are thoroughly and conservatively graded and all condition issues are noted; all items are secondhand and may have slight signs of gentle use. Tracked packet insured air post shipping to the U.S. starts at $16.50 (other spots may vary) - tracking/insurance up to $100 is included. Items paid with a credit card will be shipped to confirmed addresses only. We do ship internationally. All of our prices are in $US. PLEASE NOTE: We DO NOT accept Paypal. A vintage Art Nouveau sterling size 5-3/4 ring c1900-20. 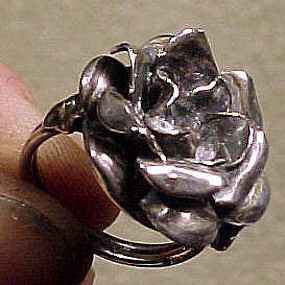 This 3/4" across ring is in the form a flower with finely formed petals and small flowers on the double wire shank; it is stamped STERLING, it weighs 6.1 grams, and it is in excellent original condition with no dents, bends, corrosion, losses, damage or repairs. All items are thoroughly and conservatively graded and all condition issues are noted; all items are secondhand and may have slight signs of gentle use. Surface shipping to the continental U.S. starts at $6 (other spots may vary) - insured is higher, and mandatory on items over $85 if paid with a credit card. Items paid with a credit card will be shipped to confirmed addresses only. We do ship internationally. All of our prices are in $US. 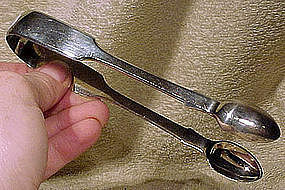 A pair of English sterling William IV sugar tongs, fully hallmarked for London 1834. 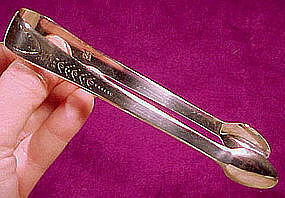 These 5-3/4" tongs were made by Wm. Ely, they weigh 50.8 grams,and they are in excellent original condition with no dents, bends, corrosion, losses, damage or repairs. All items are thoroughly and conservatively graded and all condition issues are noted; all items are secondhand and may have slight signs of gentle use. Tracked packet air shipping to the U.S. starts at $17.80 (other spots may vary) - insurance and tracking included. Items paid with a credit card will be shipped to confirmed addresses only. We do ship internationally. All of our prices are in $US. PLEASE NOTE: WE DO NOT accept PayPal, only VISA and MASTERCARD. 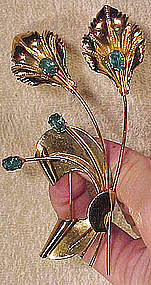 A large and flashy unsigned gold plated rhinestone brooch c1950-60. This 2-7/8" x 2" pin features a large watermelon rhinestone, with teal and deep blue and grey/blue claw-set marquise rhinestones. It also has blue and green aurora borealis stones, and it has a safety catch. This item is in excellent original condition with no cracks, dents, bends, corrosion, losses, damage or repairs other than one small green rhinestone which has a chip on the table. All items are thoroughly and conservatively graded and all condition issues are noted; all items are secondhand and may have slight signs of gentle use. Surface shipping to the continental U.S. starts at $6 (other spots may vary) - insured is higher, and mandatory on items over $85 if paid with a credit card. Items paid with a credit card will be shipped to confirmed addresses only. We do ship internationally. All of our prices are in $US. 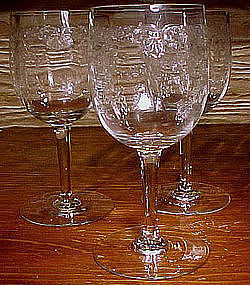 A group of three 6-3/8" tall etched wine goblets in the Queen's Lace pattern by Bohemia. These glasses are in excellent original condition with no chips, cracks, damage or repairs. All items are thoroughly and conservatively graded and all condition issues are noted; all items are secondhand and may have slight signs of gentle use. Surface shipping to the U.S. starts at $10.50 for one ($14.50 for 3) (other spots may vary) - insured is higher, and mandatory on items over $85 if paid with a credit card. Items paid with a credit card will be shipped to confirmed addresses only. We do ship internationally. All of our prices are in $US. PLEASE NOTE: We DO NOT ACCEPT PAYPAL, ONLY VISA AND MASTERCARD. 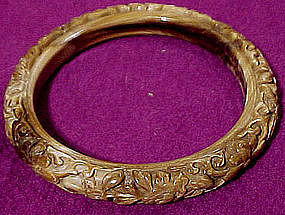 A finely hand-carved rootbeer and cream coloured celluloid bangle c1930s-40s. This 7/16" wide bracelet measures 2-7/16" across the interior and 3/8" thick. 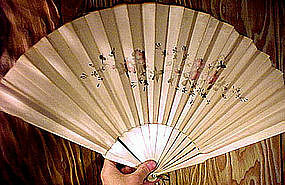 It has deep floral carving, and it is in excellent original condition with no chips, cracks, losses, damage or repairs. All items are thoroughly and conservatively graded and all condition issues are noted; all items are secondhand and may have slight signs of gentle use. Small packet air shipping to the U.S. starts at $9.50 (other spots may vary). Items paid with a credit card will be shipped to confirmed addresses only. We do ship internationally. All of our prices are in $US. PLEASE NOTE: We DO NOT accept PayPal, only VISA and MASTERCARD. 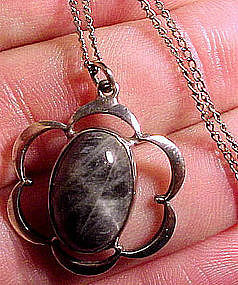 An elegant 1" x 7/8" sterling pendant with a genuine oval Labradorite cabochon stone. This necklace includes a sterling silver 18-1/2" fine chain with a springring catch; this item is in excellent original condition with no chips, cracks, dents, bends, corrosion, losses, damage or repairs. All items are thoroughly and conservatively graded and all condition issues are noted; all items are secondhand and may have slight signs of gentle use. Surface shipping to the continental U.S. is $6 (other spots may vary) - insured is higher, and mandatory on items over $85 if paid with a credit card. Items paid with a credit card will be shipped to confirmed addresses only. We do ship internationally. All of our prices are in $US. A nice pair of Georgian English sterling 5-5/8" sugar tongs with elegant bright cut decoration. These tongs were made by Thomas Wallis and Jonathan Hayne in London, England 1816-17; they weigh 24.5 grams, they have an S over WxM monogram, and they are in excellent original condition with no dents, bends, corrosion, losses, damage or repairs. All items are thoroughly and conservatively graded and all condition issues are noted; all items are secondhand and may have slight signs of gentle use. Tracked packet air shipping to the U.S. starts at $16.80 (other spots may vary) insurance and tracking included. Items paid with a credit card will be shipped to confirmed addresses only. We do ship internationally. All of our prices are in $US. PLEASE NOTE: WE DO NOT accept PayPal, only VISA and MASTERCARD. 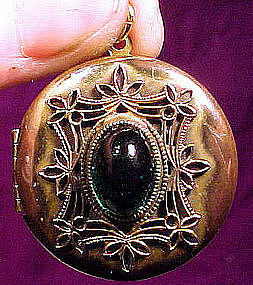 An elegant Edwardian period gilt photo locket with a green glass cabochon stone c1910-20. This 1-3/8" locket pendant features two retaining bezels with celluloid windows on the interior and a bezel set deep emerald colour green glass stone, which is surrounded by a raised ornate applied setting. It is in very good original condition with no chips, cracks, dents, bends, corrosion, losses, damage or repairs other than some minor wear on the front showing copper and some spotting on the original lacquered coating on the back. All items are thoroughly and conservatively graded and all condition issues are noted; all items are secondhand and may have slight signs of gentle use. Small packet air shipping to the U.S. starts at $9 (other spots may vary) - insured is higher. Items paid with a credit card will be shipped to confirmed addresses only. We do ship internationally. All of our prices are in $US. PLEASE NOTE: we DO NOT accept PayPal, only VISA and MASTERCARD. 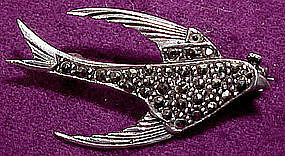 An attractive 1930s sterling silver 1-3/8" pin in the form of a flying swallow. 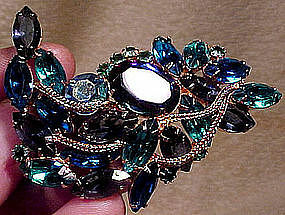 This brooch is encrusted with flashy marquisites, it has a safety catch, it weighs 3.6 grams, it is stamped 925, and it is in excellent original condition with no chips, cracks, dents, bends, corrosion, losses, damage or repairs. All items are thoroughly and conservatively graded and all condition issues are noted; all items are secondhand and may have slight signs of gentle use. Surface shipping to the continental U.S. is $6 (other spots may vary) - insured is higher, and mandatory on items over $85 if paid with a credit card. Items paid with a credit card will be shipped to confirmed addresses only. We do ship internationally. All of our prices are in $US. 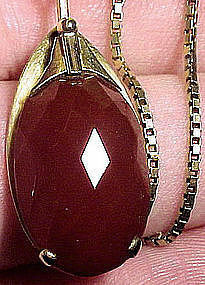 A 14K Art Deco Art faceted carnelian pendant necklace with a 14K yellow gold chain circa 1930. This yellow gold European 1-1/2" x 5/8" pendant has a nicely facetted natural carnelian stone, it has an indistinct maker's mark and a leaf gold mark (The Netherlands). It includes a 14k yellow gold 18" length chain of more recent manufacture, with a spring-ring catch - the chain is stamped 585 (for 14K). This necklace weighs 7.6 grams, and it is in excellent original condition with no chips, cracks, dents, bends, corrosion, losses, damage or repairs. All items are thoroughly and conservatively graded and all condition issues are noted; all items are secondhand and may have slight signs of gentle use. Expedited tracked air shipping to the U.S. starts at $23 (other spots may vary) - insured is higher, and mandatory on items over $95 if paid with a credit card. Items paid with a credit card will be shipped to confirmed addresses only. We do ship internationally. All of our prices are in $US. Please note that we do NOT accept Paypal. 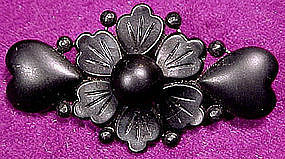 An attractive Victorian style vintage hearts and flower pin in black satin glass c1920s. This 1-5/8" x 7/8" pin has a brass c-clasp, it is stamped CZECHOSLOVAKIA on the pin, and it has a black japanned finish to the back of the pin. It is in excellent original condition with no chips, cracks, corrosion, losses, damage or repairs. All items are thoroughly and conservatively graded and all condition issues are noted; all items are secondhand and may have slight signs of gentle use. Small packet air shipping to the U.S. starts at $8.95 (other spots may vary) - insured is higher. Items paid with a credit card will be shipped to confirmed addresses only. We do ship internationally. All of our prices are in $US. PLEASE NOTE: WE DO NOT accept PayPal, only VISA and MASTERCARD.